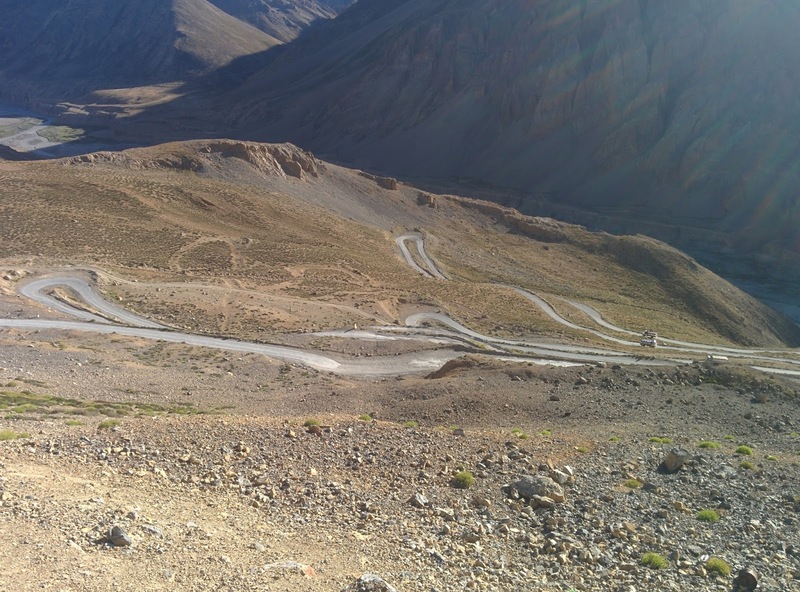 Road Less Travelled: 475 Km Leh - Manali Stretch One Of The Best Road Trips In India! 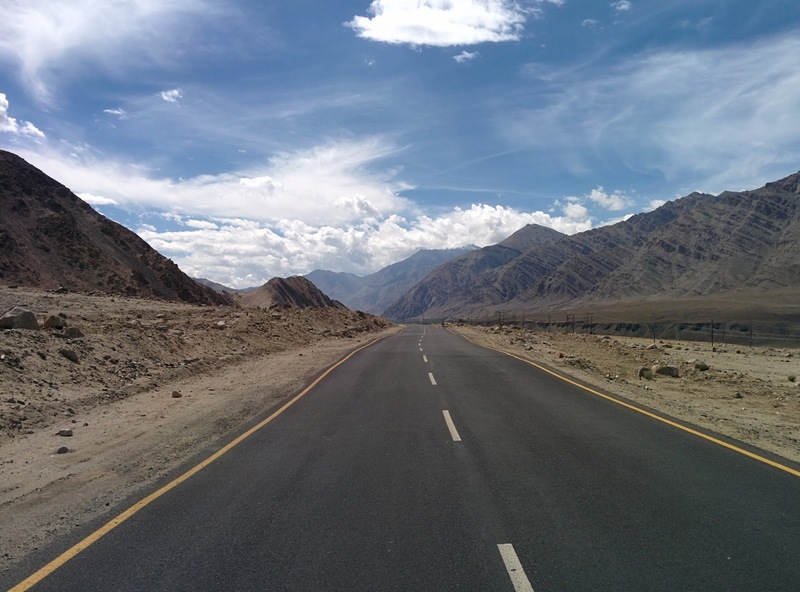 475 Km Leh - Manali Stretch One Of The Best Road Trips In India! The rhythmic thump of Royal Enfield Bullets on a deserted road in the middle of barren land surrounded by cold mountains with hardly any civilization is what attracts bikers from all over for an epic road trip to Ladakh and the highway that is most preferred is the Leh- Manali highway. Apart from the stunning landscapes, this highway offers many challenges- Bad roads, glacier melts resulting in water crossings on the road, landslides, slush, high mountain passes, unpredictable weather, strong and cold winds making this ride even more special and challenging. Though the Sonamarg - Leh highway has several attractions and breathtaking landscapes the Leh- Manali Highway is in a different league! We had saved the best for last and after 41 days we bid adieu to the beautiful land of Ladakh, we were in for the finale of our dream trip- our ride from Leh to Manali. This 475 km ride back to Manali is an experience in itself that any rider would vouch for with so many surprises, challenges and heart stopping moments. No wonder this particular road trip is rated very high and is in the bucket list of adventure seekers. This journey requires a minimum of two days but we completed it leisurely in 4 days with 3 stop overs. 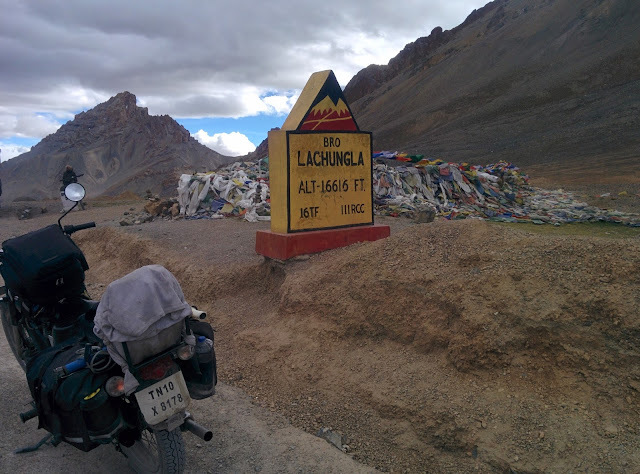 Leh- Taglang La- Debring- More plain- Pang- Lachungla- Nakeela- Gata loops- Baralacha La -Sarchu- Suraj tal- Deepak tal- Tandi- Sissu- Rohtang Pass- Keylong- Jispa- Manali- Mandi- Chanidgarh. We left from Leh way too early in the morning and the roads were beautiful blacktop until Pang. It was beautiful to have the entire road for ourselves and the massive mountains and the cold wind for company. There were pleasant surprises en route, we saw herds of yak grazing in the fertile lands and we also saw cute little Himalayan hare criss-crossing the highway. An important thing to keep in mind is that the Indian Oil Corporation pump in Karu (34 km from Leh) is the last fuel pump on this route. One has to top up the tank and carry spare fuel as the next stop is in Tandi, Himachal which is around 360 km away. Our first challenge of the day was riding up the mighty Taglang la Pass, the second highest pass that we crossed in this trip. There was no massive crowd here unlike Khardung La. From here the road until Pang was a delight- classic black top. After Taglang La we had a small pit stop for maggi in Debring, which is not a town but a make shift tented accommodation place set up by the locals for travelers in the middle of vast uninhabited land. For the cold weather and tired body, a bowl of hot maggi and black tea is the best reward. After Debring, we reached the green More Plains. This vast stretch of land with mountains on both sides and black smooth tarmac road in the middle is any biker's dream road and is accompanied by the amazing natural sand art sculptures. These natural sand sculptures left us wondering how pristine the beauty of this land is and if if there is anything that this highway actually does not offer. This beautiful road continued till Pang. Pang is another stop over on the Leh- Manali highway and offers decent options to halt for the night. Though basic, these stay options are a blessing for any traveler in this altitude. We stopped for a hearty lunch in Pang- Potala Pang Restaurant- a small shack run by a very humble and kind man. At 15000 feet above sea level in such unforgiving harsh climatic conditions, he had set up shop to feed travelers. Yes, he charges money for food but to us it was nothing less than a noble service. 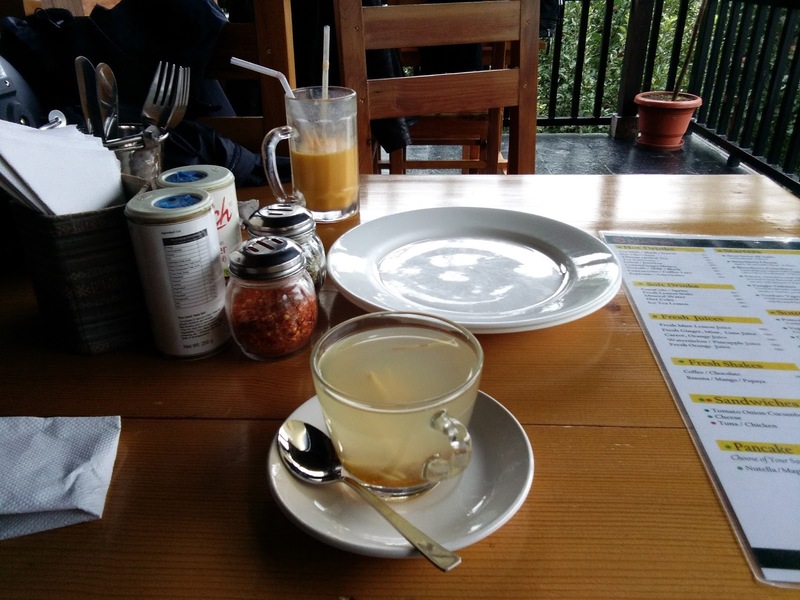 We had the best dal chawal, masala omelette and black tea here. All this costed us only Rs.160. Pang is the best bet for food as the next sign of civilization is far away in Whiskey Nalla and Sarchu. We decided to continue our journey and halt for the day at Sarchu which was around 70 km from Pang. Next stop was Lachulung La at 16000 feet, followed by Nakee La at 15500 feet. It was so peaceful to ride through these high mountain passes and stop there for a while to soak in the beauty around. These passes were the only sign of construction in the deserted mountains and the prayer flags fluttering around were the only thing that gathered our attention. The vast number of stones left near these passes added more beauty to them. And then comes the best part of the highway- the super winding and exciting Gata Loops- 21 in total. The stretch from Pang to Gata Loop is in its worst shape possible (2016). But after doing Pakachik and Nubra stretch we wouldn't really complain. Though the roads were not in their best condition, it was thrilling to ride on these amazing hair pin bends. 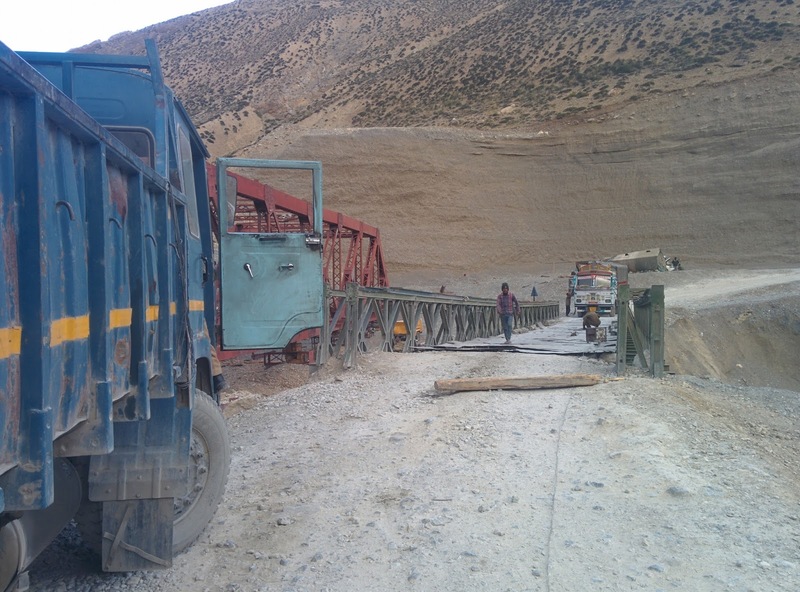 These loops covering a distance of 13 km ensured an ascent from 4198 m to 4664 m.
Just 25 km short of Sarchu, we were stopped by the friendly BRO who were carrying out repair work on an iron bridge over a river. After the damage on the bridge was fixed, we crossed over and managed to reach Sarchu just in time before the sun set. 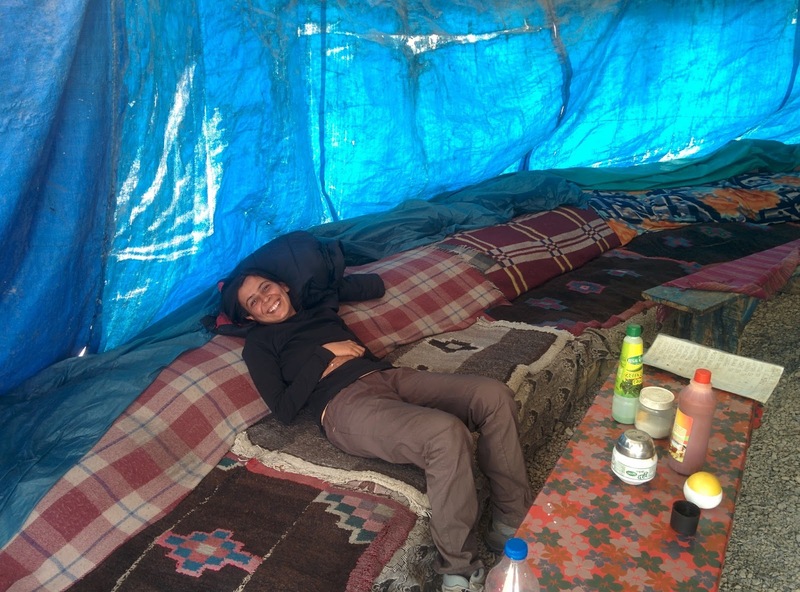 We opted to spend the night at one of the cozy tents set up by locals. 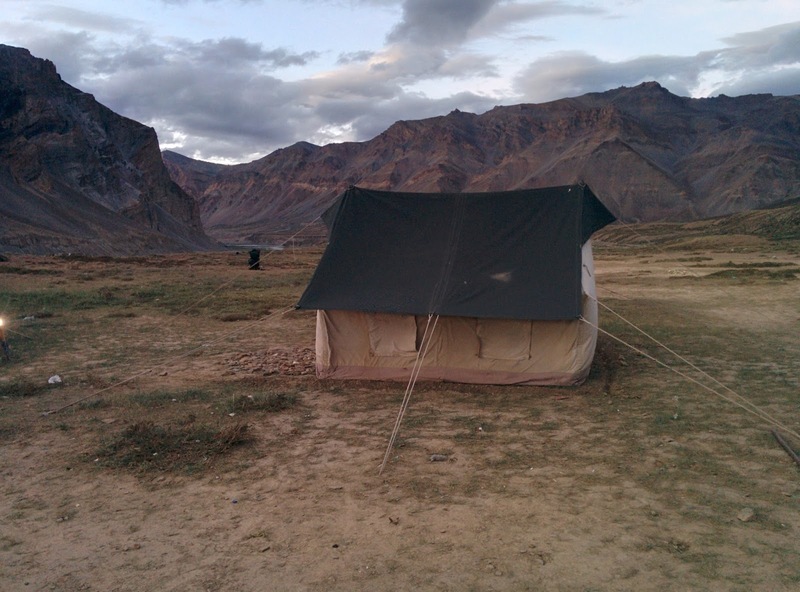 We got a steal deal of Rs.1000 for a spacious tent inclusive of food in such dramatic location. We had parked our bike almost inside our tent. It gets very cold in Sarchu so be prepared with a lot of warm gear. We were able to sleep only after being covered in 3 layers of clothing plus two massive quilts that helped us stay warm. Sarchu is NOT an ideal overnight stop if you are riding from Manali to Leh due to its high altitude(14000 feet.) Jispa or Keylong would be perfect overnight stops in Manali - Leh route. We left at dawn from Sarchu and on this day we got the experience the actual wild side of Leh-Manali highway. We encountered 7 massive nallas or water crossings that day combined with rain. It was a total adrenaline rush to cross the massive water crossings. We left very early in the morning so we could be at the mercy of these glacier melts that run across the highway and it totally worked in our favor. We had just reached the Sarchu check post and it started to drizzle. The highway is known for its unpredictable weather and we were prepared. We quickly put on our rain gear and continued with our ride. Just after crossing Sarchu check post, we encountered the longest water crossing in this route. An entire hair pin bend was covered by running cold water. It more felt like the road was flooded in knee deep water and we were riding on a riverbed. 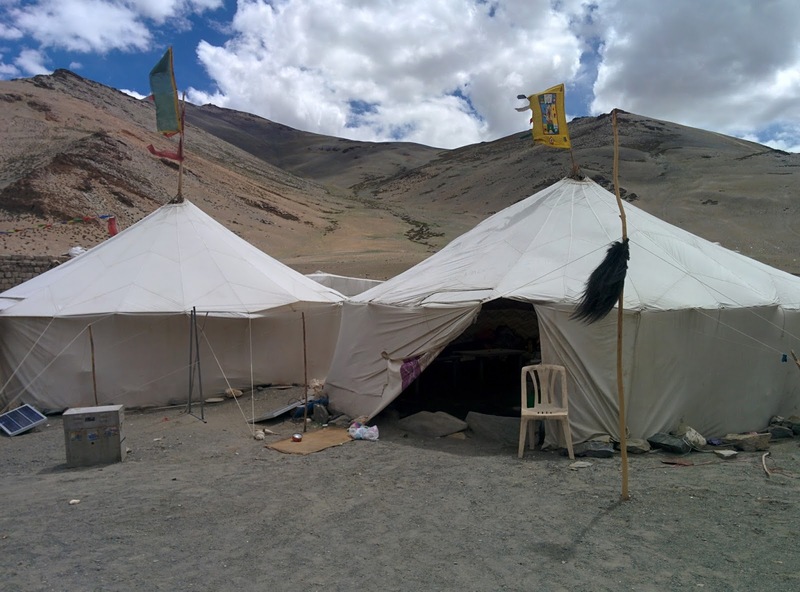 There are several tented accommodations that are made available or have been pitched for a few kilometers from Sarchu. Almost all of them looked very promising, however, none seem to have an attached bath. Right after this we started our steep ascent to Baralacha La at 4815 m. The conditions were extremely cold, we were wearing multiple layers of thermal, thick jacket, gaiters, sturdy shoes, two pairs of thick layered woolen socks, riding gloves and rain gear. Despite all this, it was quiet cold thanks to the strong winds. Though our fingers became numb and started hurting, it was all part of the journey and we did not give it much thought as we were too engrossed in enjoying the views. The beauty of Nature totally makes it up and after Baralacha La, we crossed the State border and entered the beautiful green Himachal Pradesh. We were greeted by the sparkling Suraj Tal lake. We continued on the winding roads and crossed over massive Nallas and were extremely thankful to our bike that didn't give up once and took us through safely across these unforgiving water bodies. In between, we stopped to admire Deepak Tal. Thanks to no art director choosing these lakes for any hit movie, there was hardly any crowd. The pristine lakes were all for us. We crossed over Jispa, Keylong and finally Tandi where we stopped to fill up the fuel tank. We were greeted with more rains once we crossed over to Himachal as it was monsoon season. As we entered Himachal, it was continuously drizzling so be well prepared. 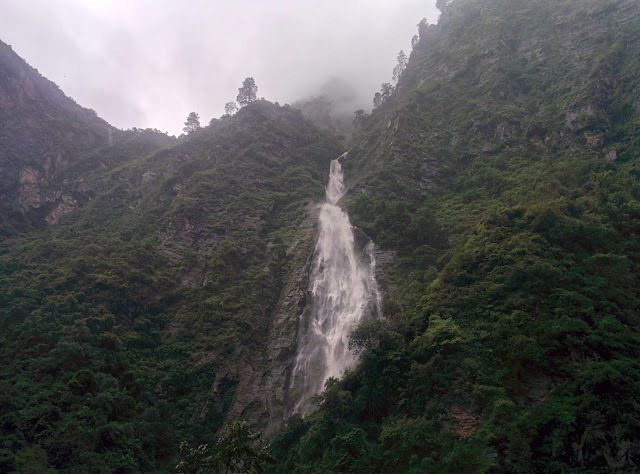 The mighty Himalayas is home to several waterfalls that could be viewed from the highway. We had a very tough time focusing on the highway. The hills and the landscapes in Himachal are very different from what we encountered in Ladakh. While the places in J&K are at a higher altitude, the hills and mountains have a more antique look with rocks, sand, stone and mud and brief patches of greenery and wide rivers cutting through them. While Himachal is on the brighter side with colorful fields, though at a lesser altitude, mountains are huge, completely green with massive trees. The gorges are way too deep and the rivers cutting through them have very narrow passes and the water gushes with great speed. Plus, the large number of glacier melts in Himachal lead to waterfalls towering hundreds of feet and joining the rivers making it an awesome sight. The temperature in Ladakh makes the glacier melt a slow and gradual process. The fields in Himachal are bright and colorful making it look like a rainbow on the mountain. With continuous rains that seemed to just get heavier, we decided to halt overnight at Sissu. Compared to highly commercialized Jispa and Keylong, we preferred the calm and quiet Sissu for our overnight halt before encountering the mighty Rohtang La. The entire stretch from Sarchu to few kilometers before Sissu, the road conditions are pretty bad barring a few kilometers. Sissu turned out to be a perfect place to stop overnight, it had a massive waterfall and a beautiful lake surrounded by lush green fields. A peaceful vacation couldn't have been more perfect. We checked into Hotel PLM Dhara in Sissu on the Sissu- Manali Highway. They offer good, spacious and clean rooms with 24 hour running hot water and excellent view from the room. The food here was amazing and they served generous quantity. Their service was top notch and pricing was very reasonable. We again left early in the morning and were prepared to cross the challenging Rohtang Pass. It had been 2 full days since we had seen the sun. The dark clouds kept up the consistency and entered the third straight day. Just after Sissu and before crossing Rohtang La, there were quiet a few water crossings on the way due to continuous rains the previous day. It was rather easy to cross the water nallas but it was extremely tough and challenging to ride to Rohtang La pass with massive stretches covered with slush. The bike kept swaying due to the saddle bag and it was a challenge to not lose grip and fall over. We are extremely thankful to our reliable bike that braved it all and finished the treacherous stretch without stopping even once. True to its tag line "Made like a gun, goes like a bullet." We did not have an option but to continue riding despite the drizzle. We were so thankful that it was not pouring. After crossing Rohtang La, we got absolute amazing roads till Mandi and en route were greeted by the amazing tunnel that has not only cut short the distance but gives an amazing feel to ride under a massive mountain. On the other side, a pleasant surprise awaited us. A mammoth waterfall cascading several hundred feet down into the river. The continuous drizzle or slush or rough roads did not annoy us one bit. But at one particular junction, devoted temple sevaks were annoying to say the least, they were distributing prasad and something to drink to travelers. They created a lot of ruckus and vehicles big to small stopped to take the prasad resulting in unnecessary traffic jam and decorating the entire highway with paper cups and plastic spoons. People threw the waste on the highway after they were done eating. By no means, are we suggesting that the temple should not give out prasad or quench thirst but is it too much to ask to not block traffic and dirty the streets? Could they not give this to devotees who walk into the temple? Again another instance of inconvenience on National Highway in the name of religion. After covering 190 km and with continuous rains hampering our visibility we stopped 10 km short of Mandi and checked into Hotel Sally and nearly after a month our hotel in Mandi had a fan. They offer amazing clean rooms with 24 hour running hot water and kickass views of river Beas and surrounding green hills. Tired with the ride we ate and crashed for the day. We left from Mandi and the roads were in pretty good condition an reached Manali in no time. En route we stopped for brunch at Pizza olive in Manali that has been in business for several decades and true to it's name served amazing Pizza and drinks. The views from the restaurant are killer. A good hearty meal costed us Rs.620. Reading tragic news about massive floods in Rajasthan, Uttarakhand, Bihar and Chattisgarh and Himachal receiving continuous rains in the last few days, (July 2016) we were worried sick if we would also be boxed in due to landslides or any other untoward incident. There have been enough signs off late that we should respect Nature more and just praying and hoping does not really help. We seriously need to get our act together. Massive caved in roads, smaller landslides en route and continuous rain again confirmed our fears. We thought it would be best to leave the hills asap and did not stop overnight in Manali but continued our ride to Chandigarh. From Leh-Mandi, the last 3 days have been an absolute back breaker and adventurous at the same time. On an average we clocked 200 km per day. It might not seem like a lot but taking into consideration high altitude passes, extreme weather, treacherous roads, massive water crossings, and the slush, it was one hell of a ride. A few things to keep in mind while riding on the highway are - It would be a good idea to cross over Rohtang La quiet early in the morning. It is best to avoid to cross Rohtang when it is raining as it results in heavy traffic on these narrow roads plus the deep depression that the heavy vehicles leave on the slush creates unnecessary trouble. These things make the conditions even more tougher for any rider. While on a road trip to Ladakh via Himachal not all but most of the pick up truck drivers drive quiet rashly and have no regard or respect for uphill vehicles. It always seems like they are in a massive rush to reach their destination and at anytime could knock you out so it is best to be mindful and ride safe. Incredible pictures. Loved it. thanks for sharing this blog with us.